Vintage Barbie Fashion Queen Dolls were released in 1963. 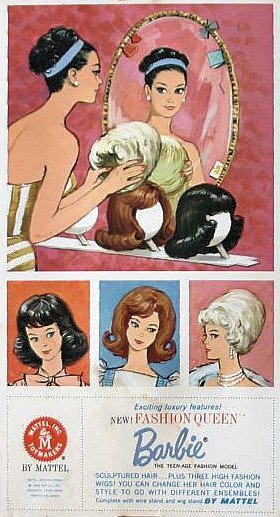 Wigs were a popular fashion item in the early to mid-1960s. Fashion Queen Barbie had molded painted hair and came with three wigs. One of the highlights of my elementary school days was when my teacher's wig fell off into the trash can. When I think of wigs I always remember that! Hopefully Barbie had better luck! Fashion Queen Barbie also came with a white plastic wig stand and three wigs: red flip, brunette pageboy and blonde bubble. Mattel issued a Fashion Queen Reproduction in 2010 as part of the My Favorite Barbie series.